The Giving Tree is a working tree which serves to support the excellent work of two highly respected charities in the local community – Bath Cats and Dogs Home and Julian House for the Homeless. The fifteen foot Nordic Pine looks especially beautiful as a focal point at Lamb Yard and has been decorated with the help of local school children who have created glass decorations with the help of glass artist Alex Compton. 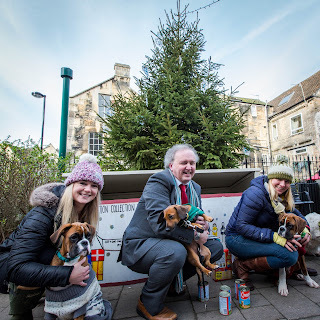 The Giving Tree was set up by teacher and local resident Christopher Curtis who wanted to help Bradford on Avon shine at Christmas time and also serve as an easy to reach collection point for the chosen charities. Members of the community are invited to donate gifts which are collected each day. Sealed and in date cereals, rice, tea/coffee, sugar. With the Doghouse and Co-op right next to the tree, if you forget to bring something into town, you can always nip in and buy a last minute item to donate.